Nicolaus Mulerius (Bruges 25 December 1564 - Groningen 5 September 1630) was a professor at the University of Groningen between 1614 and 1630. 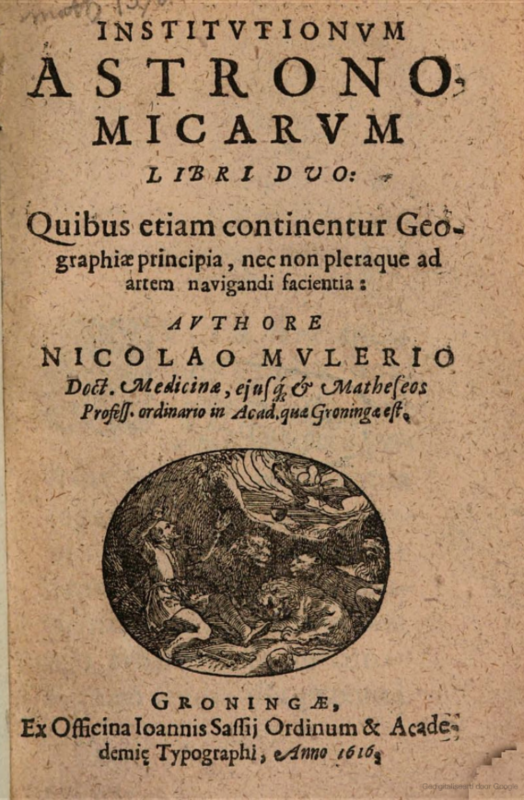 Nicolaus Mulerius, astronomer, mathematician, and physician, was born on 25 December 1564 in Bruges. He was one of the children	of Pierre des Muliers and Claudine le Vettre, who originated from Rijssel (Lille). Both parents belonged to the religious movement of the Anabaptists. In those years the Seventeen Provinces, which roughly speaking made up the present Netherlands, Belgium, and Luxemburg, were involved in a war with Spain and later in a civil war based on political, economic, and religious differences. Because of their religion the mother and the youngest child of the family were arrested by the Inquisition (Inquisitio haereticae pravitatis) and in 1568 the mother was buried alive when she did not want to change faith. The father and three of his children escaped arrest by the Inquisition. Nicolaus received some education in calvinist Bruges, among others from the Flemish humanist Jacobus Cruquius. Around 1580 Petrus Mulerius (Pierre des Muliers had latinized his name) and his son Nicolaus arrived in Leyden. In 1582 Nicolaus started as a student at the University of Leyden, a relatively new school which had been founded in 1575. He studied theology (Danaeus), history and law (Lipsius), Greek (Vulcanius), mathematics (R. Snellius), oriental languages (Raphelengius), and medicine (Heurnius and Bontius). Mulerius obtained the degree of doctor in medicine in 1589. In the same year he married Christina Maria Six (1566-1645), whose family had also fled from the Southern Netherlands; together they would get eleven children, six of whom would survive their father. In the meantime Nicolaus had converted to calvinism, possibly because of his marriage. In 1590 Nicolaus and his young family moved to Harlingen, an important port on the Friesland side of the then Zuyderzee, where he would be a respected city physician. While in Harlingen he published his book Cort onderwijs van het gebruyck des astrolabiums (Harlingen 1595). In 1603 the family moved to Groningen where Nicolaus obtained the position of medicus provincialis, i.e. physician for the province (Stad en Ommelanden). However they returned to Friesland in 1608 when Nicolaus became the (calvinist) supervisor of the (lutheran) rector of the Latin school in Leeuwarden. In the same year appeared a mock-catholic pamphlet written by Mulerius lamenting Dutch incursions in the Indies. 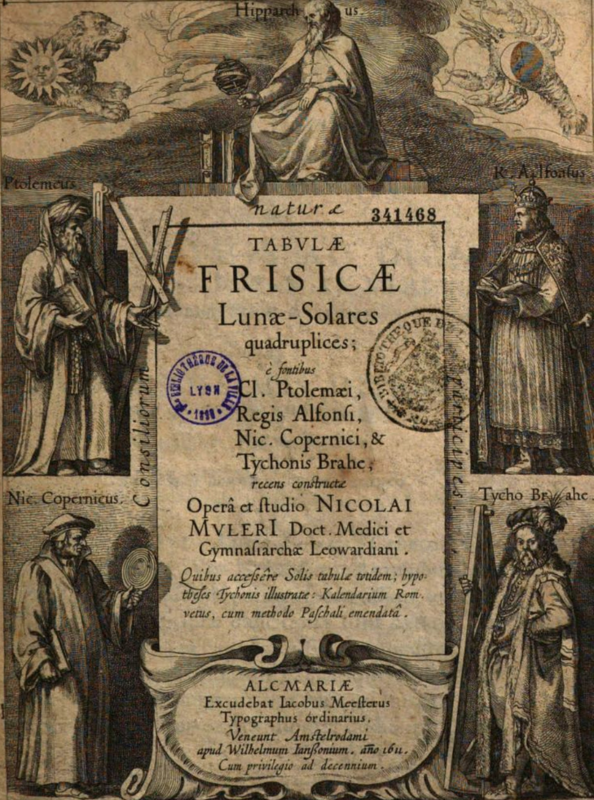 From the Leeuwarden period also dates the book Tabulae Frisicae (Alkmaar, 1611) containing tables about the position of sun and moon; the title page shows Hipparchus, Ptolemeus, Nicholaus Copernicus, king Alfonso X, and Tycho Brahe. Already in 1604 Mulerius published an annual almanac for the general public; later the almanac would be continued by his son Petrus Mulerius and by Johannes Borgesius. Professor in Groningen. The University of Groningen had been founded in 1614 by the States of Groningen. It was not the only university in the Northern area: already in 1585 the States of Friesland had initiated the University of Franeker, where in the summer of 1629 Ren� Descartes would be a student of Adriaan Metius for some time. The other places of higher learning in the Netherlands were the University of Leyden, mentioned above, and the Illustrious School in Harderwijk (1599). The first rector of the University of Groningen was Ubbo Emmius, a friend of Nicolaus Mulerius. 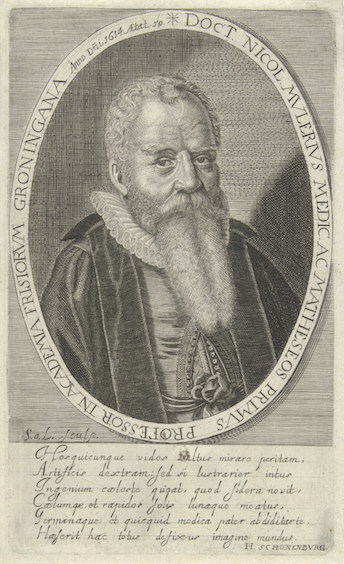 In 1614 Ubbo Emmius succeeded in getting Nicolaus Mulerius to move to Groningen where he would teach mathematics and medicine, and act again as medicus provincialis. An earlier offer in 1613 to become professor in Hebrew at the University of Franeker had been turned down by Mulerius. 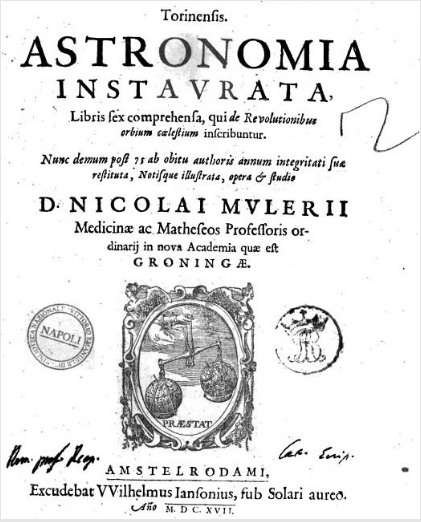 One of the first books appearing at the University of Groningen was Mulerius' 1616 textbook, in two parts, on astronomy: Institutionum astronomicarum libri duo (Groningen 1616, reprinted 1649). In the following year, 1617, Nicolaus Mulerius published the third, updated and annotated edition of Nicolaus Copernicus's De revolutionibus orbium coelestium. 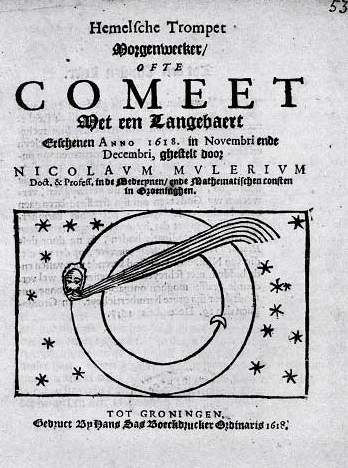 In 1618, the year of the Dordrecht Synod, Mulerius published a pamphlet Hemelsche Trompet Morgenwecker ofte Comeet Met een Langebaert Erschenen Anno 1618 in Novembri ende Decembri about a comet (with a long beard) which had appeared at the end of that year: the message was that only if, like the citizens of Nineve, we turn to God, praying, fasting, and crying, shall we escape our just punishment. 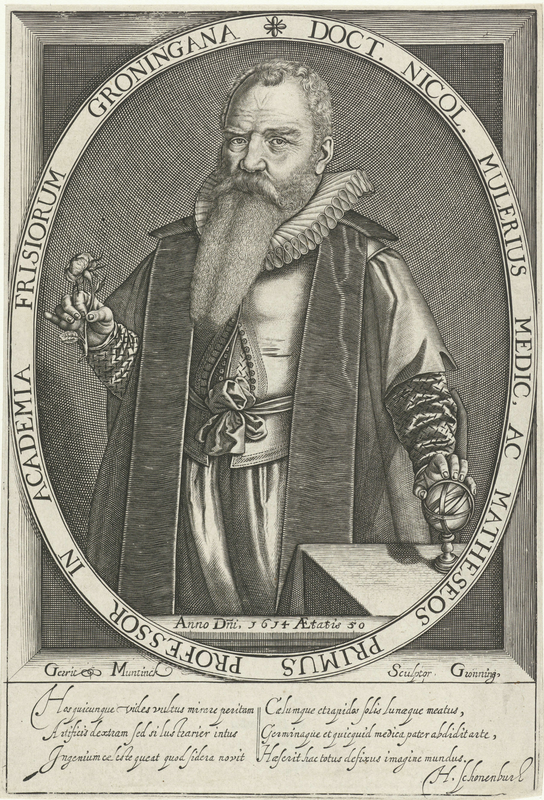 Mulerius must have had a number of students in medicine; in the Effigies one is mentioned by name, Conradus Matthaeus, who obtained his doctorate in 1627 and became one of the professors in medicine in 1631 after Mulerius had died. Mulerius served as rector magnificus of the University in 1617-1618 and in 1627-1628. He was also the first librarian of the university library, founded 28 February 1615; he served again as a librarian in 1619-1621 and 1626-1630. In this capacity he composed in 1619 the Librorum Academicorum Syllabus, an inventory of the university library, which consisted of over four hundred volumes. This catalog would be continued till the 18th century. In 1622 Mulerius joined the newly founded Groningen Chamber of the Dutch West India Company (Geoctroyeerde Westindische Compagnie), possibly because some astronomical background might be useful for traveling at sea. In all these years in Groningen Mulerius seems to have been continuing a medical practice. 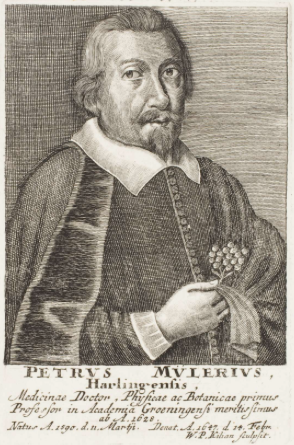 Mulerius died suddenly on 5 September 1630; his widow survived him till 1645. The eldest son, Petrus Sixtus Mulerius (1599-1647) was educated in Groningen and Leyden. 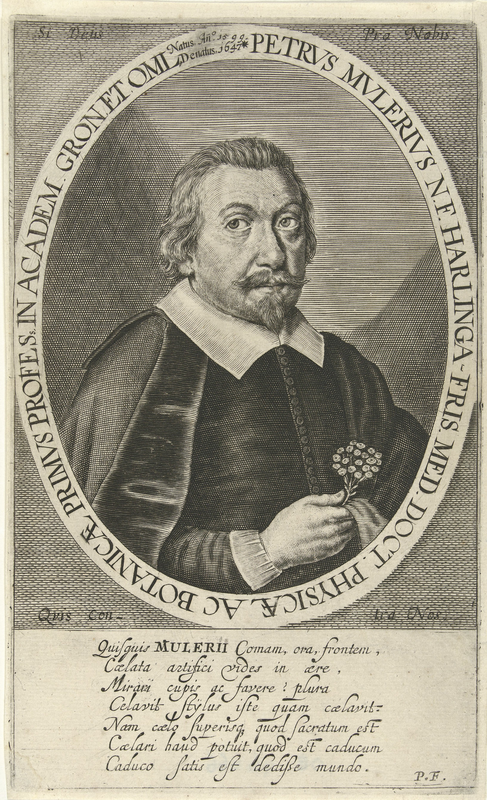 Petrus would become professor at Groningen in physics and botany in 1629, giving his inaugural lecture on the same day as his father's successor Matthias Pasor (1599-1658). Petrus was going to experience all kinds of problems at the university but in his description in the Effigies these difficulties are discreetly forgotten. 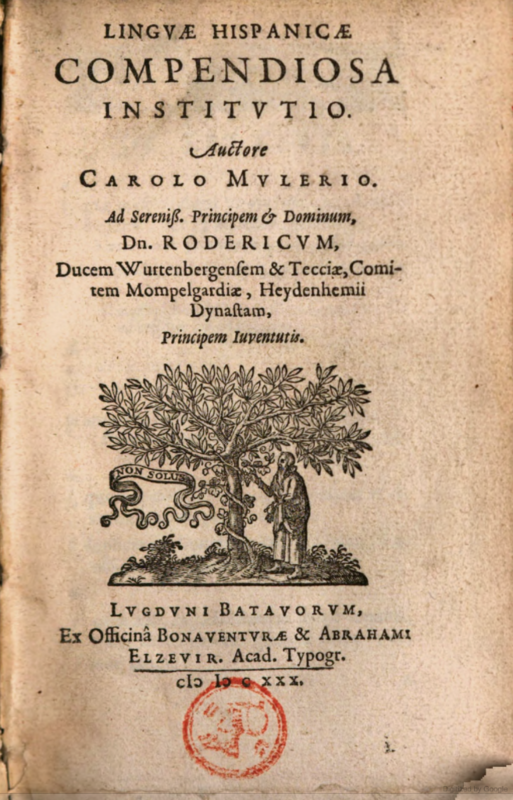 Another son, Carolus Mulerius (1601-1638) wrote language books for Spanish, Italian, and French. His last book Een korte ende seer dienstighe onderwijsinge Vande Spaensche Tale, was the first grammar of Spanish written in Dutch; it was published posthumously in 1648. A grandson Nicolaas Mulerius (1631-1692), son of Petrus, studied theology and made a journey to Palestine; he eventually became a minister in Harderwijk and reprinted his grandfather's 1618 pamphlet upon the appearance of a large comet in 1680. Tolerance and astronomy. In order to appreciate the work of Nicolaus Mulerius remember that the introduction of protestantism in this part of the world was the beginning of many more theological divisions. 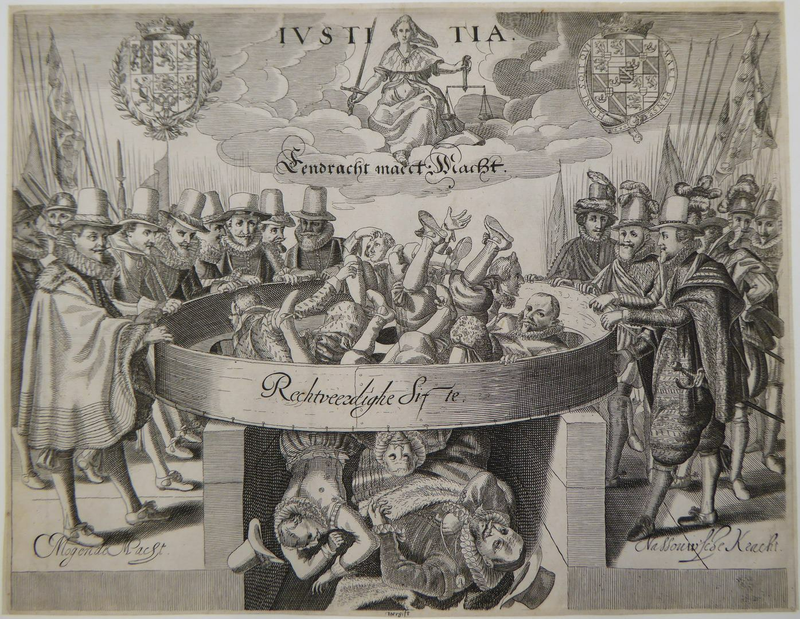 In the beginning of the seventeenth century the main issue, religious tolerance, became a battlefield; the outcome of the battle was decided at the Dordrecht Synod (13 November 1618 - 29 May 1619) in a fight over the notion of predestination. Those in favour of tolerance, the followers of Jacobus Arminius (Oudewater 1559 - Leiden 1609) lost. The winners, Franciscus Gomarus (Bruges 1563 - Groningen 1641) and his followers, backed by Prince Maurice who was about to excecute the tolerant grand pensionary Johan van Oldebarnevelt (13 May 1619), made sure that in the near future no religious tolerance would be allowed. However already under Prince Frederick Henry this extreme view would be softened quite a bit in public life. An interesting aside is that the son Petrus Mulerius must have been present at the Synod: he assembled an Album Amicorum (now in the collection VU University, Amsterdam) with 52 inscriptions of participants, hardliners with long beards (de vaders met de lange baarden). The teaching of the proper theological doctrines, now firmly established during the Synod, had been one of the main reasons to start the new university. The appointment in 1618 of Gomarus, who had been lured away from Leyden, did fit the original plans of the founders. When Mulerius arrived in Groningen he was supposed to teach medicine and mathematics. The teaching of medicine in those days was following the usual pattern: a rather dogmatic summing up of a canon of ideas that had been formed in years past. The actual inspection of the inside of the human body was an exception: Mulerius used the hall that had been reserved for that purpose only a few times. The teaching of mathematics may have had more practical components as it included such diverse topics as astronomy, geodesy, and fortification. As to astronomy, one should be aware that it was accepted knowledge that the heavenly bodies had a strong influence on individual lives; see for instance the work of Eric Jorink (below). It was in this atmosphere that Mulerius was active as a professor and that he disseminated the "new" heliocentric views, despite of what he professed to believe himself. More than eighty years later when Johann Bernoulli would arrive in Groningen the atmosphere of intolerance was still very much the same as he would experience himself; see Jan van Maanen's book on Bernoulli (below). Librarian. Not only was Mulerius the first librarian of the university, later he made an official catalog for it. He also kept his own library which in fact was larger than the one of the university. It seems to have remained intact until the death of his wife; it was auctioned off in Groningen in 1646. 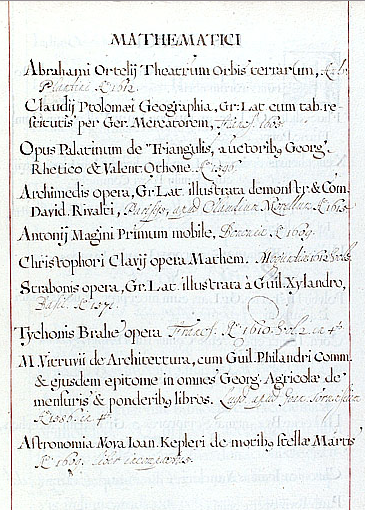 The auction catalog, together with similar catalogs related to the libraries of Beeckman and Gomarus, became eventually the property of the Bibliotheca Angelica in Rome. This collection of catalogs was mentioned in 1910 in a publication that remained unnoticed until it was brought to light by the book historian Bert van Selm at the end of the 1980s. The actual Mulerius auction catalog has been described in detail by Henk Kubbinga. Portaits of Mulerius. The official academy portrait of Nicolaus Mulerius, by an unknown master, dates back to 1618. It mentions that Mulerius was 54 and that in 1617 he had been the fourth rector. Mulerius is depicted facing the viewer with two astronomical instruments. TWO MODELS. Thanks to Henk Kubbinga. His left hand is holding an astronomical ring dial, more specifically a model developed about 1533 by Reinier Gemma Frisius (1508-1555). 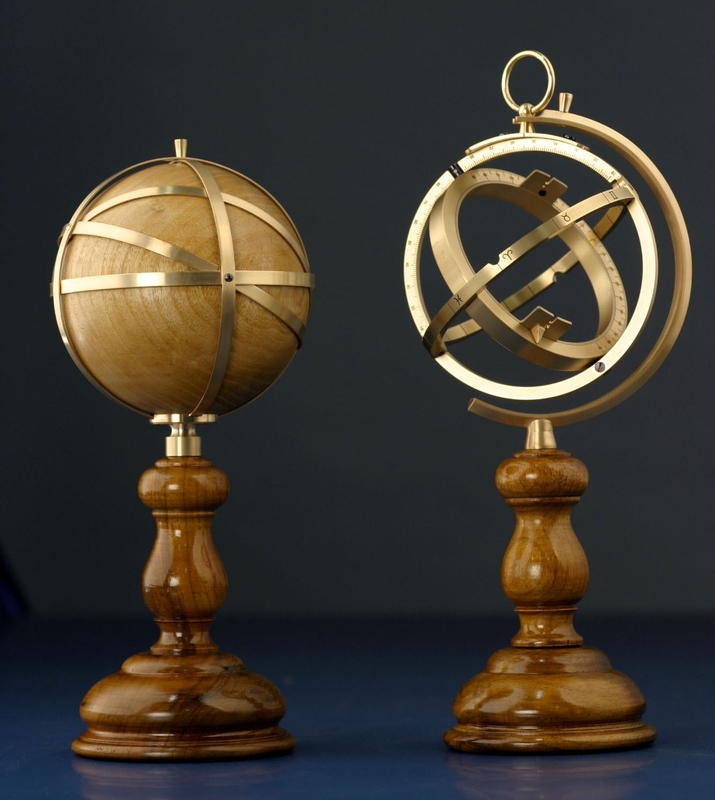 His right hand rests on a model of the earth, covered with 5 belts, typical for an earth orbiting around the sun and frozen down at a particular moment, namely at the vernal equinox. In both instruments, the position of the city of Groningen is indicated: at 53 1/4 degree Northern latitude. The models in the portrait were actually rebuilt in Groningen in 2014 ? under the supervision of Henk Kubbinga. 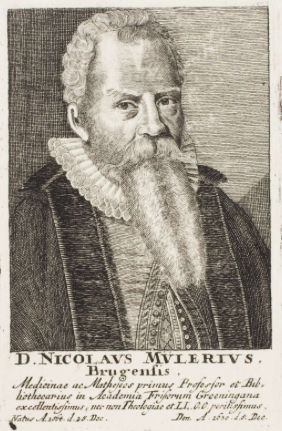 NICOLAUS ACCORDING to VAN LAMSWEERDE. Haeserit hac totus defixus imagine mundus. then the entire world would be frozen by the sight of this image. This poem appears to have been written by the local magistrate Hendrick Schonenborch who served as one of Groningen's burgomasters a number of times and who was involved with the university as a secretary and as a member of the board. He and his brother Wolter were involved with the Dutch West India Company and, in fact, Wolter served as a governor in Brasil for some time. The same volume of effigies $\&$ vitae also contains an engraving, again by van Lamsweerde, of Petrus Mulerius, who is depicted with a flower in his right hand, possibly a reminder of his botanical collection which he kept at his house at the Schuitemakerstraat. The son is honored with the following poem written by P.F., who has not been identified yet, as a kind of counterpart of the poem about the father. Caduco satis est dedibe mundo. but that burin has more hidden than engraved. to the heavens and the gods, as it is fleeting. Having given it to the fleeting world suffices. PETRUS ACCORDING to VAN LAMSWEERDE. There exists another portrait of Nicolaus in the same style as van Lamsweerde's portrait in the effigies $\&$ vitae accompanied by the same poem of Schonenborch; however this time the engraving is done by Gerrit Muntinck. Now the left hand rests on the same model of the earth while the right hand is holding a flower. There are two more portraits of father and son, each of them done by the German artist Wolfgang Kilian; they are clearly inspired by the portraits of van Lamsweerde. They appear in a late seventeenth century who's who by P.F. Freher, Theatrum virorum eruditione clarorum, 1688, which provides the pictures and lives of a great number of learned persons in Europe. W.B.S. Boeles, Levenschetsen der Groninger Hoogleeraren. In: W.J.A. Jonckbloet, Gedenkboek der Hoogeschool te Groningen ter gelegenheid van haar vijfde halve eeuwfeest, Groningen 1864. J. Israel, The Dutch Republic. Its Rise, Greatness and Fall 1477-1806. Clarendon Press 1998. Leendert J. Joosse, Een Groningse blik naar het westen: de broers Schonenborch. Stad en Lande 19(2) (2010) 6-9. Leendert J. Joosse, Hendrick in de herenbank. Miniatuur (vereniging vrienden Martinikerk) 22(1) (2018) 4-5. Eric Jorink, Tussen Aristoteles en Copernicus. De natuurfilosofische opvattingen van Nicolaus Mulerius (1564-1630). InZeer kundige professoren: beoefening van de filosofie in Groningen van 1614 tot 1996. Editor, H. A. Krop. Publisher, Verloren, 1997. Eric Jorink, Het Boeck der Natuere, Nederlandse geleerden en de wonderen van Gods schepping 1575-1715. Primavera Pers, 2006; Reading the book of nature in the Dutch golden age, 1575--1715}, Brill, 2010. H. Kubbinga, The astronomical instruments (1618) and Catalogus librorum (1646) of Nicolaus Mulerius, with an essay on his place in the history of science. Groningen University Press 2014. J.A. van Maanen, Een complexe grootheid: leven en werk van Johann Bernoulli 1667 - 1748. Epsilon Uitgaven 34, 1995. G. Mak, De levens van Jan Six, Atlas 2016. 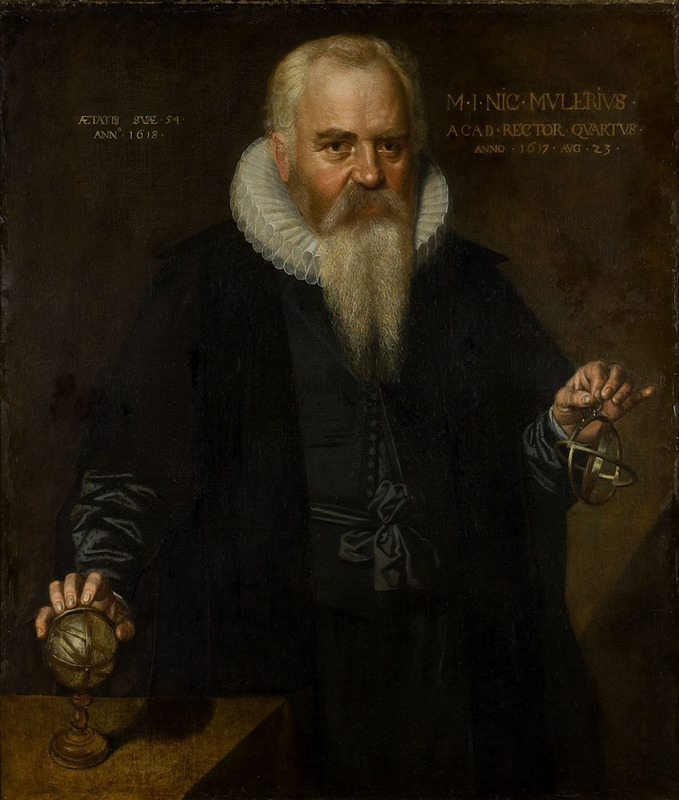 D. van Netten, Herstelde astronomie. De laatste vroege editie van Copernicus� De revolutionibus (Amsterdam 1617) en de rol van Mulerius en Blaeu, Gewina 29 (2006) 67-80. D. van Netten, Nicolaus Mulerius (1564-1630): Een geleerde uit Groningen in de discussies van zijn tijd. Barkhaus 2010. D. van Netten, Astronomia Instaurata? The Third Edition of Copernicus's de Revolutionibus (Amsterdam, 1617), Journal for the history of astronomy 43 (2012) 75-91. Anne de Snoo, De val van Oldenbarnevelt: de 'Zeefprenten' van Adriaen van de Venne, Historisch Tijdschrift 34 (2002) 63-79. Thanks. Most of what is known about Mulerius comes from the Effigies $\&$ vitae and has been repeated over the centuries. Early in the twentieth century C. de Waard's lemma in NNBW about Mulerius gives a rather even-handed view. The recent contributions of Djoeke van Netten (also about his dealings with Blaeu) and Henk Kubbinga may help creating Mulerius instaurata. We thank Steven Duintjer Tebbens for helping with the Latin, Leendert J. Joosse for information on the Schonenborch brothers, and Henk Kubbinga for providing some photographs.